At Grundfos we understand the significance of responsibility – to the environment and to the people we live, work and deal with. The Grundfos CM Booster PT is a compact booster solution designed for domestic and light commercial use. The booster unit consists of a robust CM pump, a pressure switch and pressure tank, all assembled into one unit. The CM booster PT is very easy to install, simply plug and pump. The pump offers great comfort by automatically starting and stopping according to demand, while ensuring controlled pressure in the water supply. Head Range: Upto 58 mts. CM Twin Booster set consists of two identical Grundfos CM pumps connected in parallel and mounted on a common base frame and a control cabinet incorporating motor protection and controller. 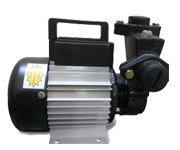 THE UPA 15-90, UPA 15-120 and UPA 120 are circulator pumps designed for pressure boosting of domestic water in residential homes supplied from an external source. The pump increases the pressure so that the required pressure is available at showers, taps and similar tapping points for domestic water. 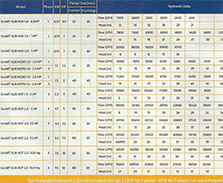 The UPA pumps are used in open systems and can also be connected directly to the water main. A flow switch starts or stops the pump when a tapping point is turned on or off. 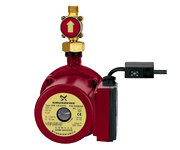 The UPA 15-90 has an internal flow switch: the UPA 15-120 come with an external flow switch which has to be placed after the outlet of the pump. The pumps are supplied with a wire with plug as required and with fittings. Stainless steel encapsulated rotor: Stainless steel rotor can and bearing plate. 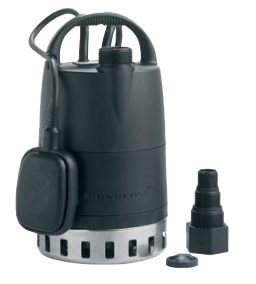 The Grundfos SB pump is a submersible booster pump designed for the pumping of clean water for domestic and rain water applications. 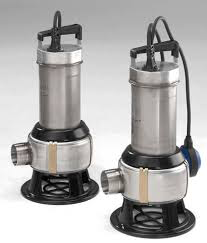 The SB submersible pump is silent when submerged and therefore a noiseless alternative to surface mounted pumps. The SB pump is built of high quality composite and stainless steel materials that are resistant to corrosion. The Sb is ideal for operation in a well or ground tanks, as it easily prevents solid particles from entering the pump. Furthermore, the pumps features a flow switch which ensures the user a convenient experience with automatic start/ stop operation and dry running protection of the pump. Noiseless operation The SB pump emits no noise when submerged and is therefore a noiseless alternative to non submersible pumps. A hot water recirculation system stops water, being wasted while people wait for their tap or shower to run hot. In fact, a typical household of three persons can save upto 16000 litres of clean, costly water every year. Plus, by having a hot water recirculation system installed, a household could annually save more than 30 hours waiting at the washbasin or the shower (that™s just 5 times, 1 minute of waiting per day). The figure is calculated as a typical household of three persons each wasting 15 litres of clean water on waiting for hot water per day. Adding a secondary return system, a return pipe to the plumbing and installing one of Grundfos premium quality comfort circulators won™t noticeably affect the overall cost of building a new house or restoring an old one. Yet the extra comfort that you™ll add to the lives of your customers will be more than apartment. The Unilift AP is a single-stage, submersible pump with semi open impeller, designed for pumping drainage water containing particles upto a size of 12. Unilift AP 12 is for automatic as well as manual operation and can be used in a permanent installation or as a portable pump. The pump is easily installed as its fitted with a carry handle and 10m mains cable. Unilift AP12 is mostly made of stainless steel, with a stainless steel sleeve for cooling during operation. The stainless steel pump sleeve is made in one piece, with a clipped one suction strainer, for easy removal, in case of maintenance. The Unilift AP is a single-stage, submersible pump with semi open impeller, designed for pumping drainage water containing particles upto a size of 12. Unilift AP 12 is for automatic as well as manual operation and can be used in a permanent installation or as a portable pump. The pump is easily installed as its fitted with a carry handle and 10m mains cable. 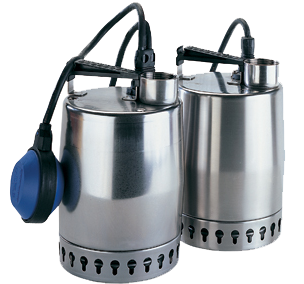 Unilift AP12 is mostly made of stainless steel, with a stainless steel sleeve for cooling during operation. The stainless steel pump sleeve is made in one piece, with a clipped one suction strainer, for easy removal, in case of maintenance.The Unilift KP is lightweight, single-stage pump with a semi-open impeller. They are designed for liquid transfer and pumping of drain water and grey waste water containing particles upto a size of 10. All Unilift KP pumps are mostly made of stainless steel, with a stainless sleeve for cooling during operation. The pumps are small and handy, suitable for permanent installation or as a portable pump. The suction strainer at the bottom of the pump prevents particles larger than the pump is designed for from entering. The suction strainer is clipped on to the pump housing for easy removal, in case of maintenance. 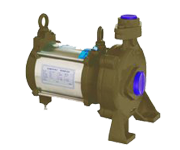 All Unilift KP pumps can be supplied with or without float switch, for automatic or manual operation. The Unilift KP is lightweight, single-stagE drainage pump with a semi-open impeller. They are designed for pumping drain water and grey waste water containing particles upto a size of 10. 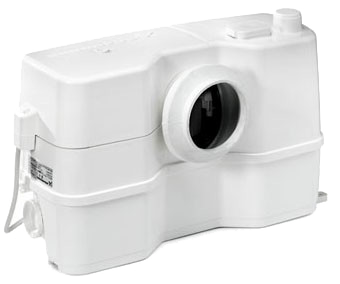 The suction strainer at the bottom of the pump prevents particles larger than the pump parts, eg the sleeve and the pump housing are made of moulded composite materials. The Unilift CC can pump down to a water level of 3mm above the floor by removing the strainer and can be used in permanent installations or as a portable pump. The unilift CC features automatic operation. The mains cable and float switch are introduced into pump sleeve through hermetically sealed cable entires. Furthermore, the Unilift CC is available with a non return flap value and self-venting valve for more convenient operation. Sololift2 is a small, ready-to-install lifting station with integrated professional cutter system. Sololift2 is suitable for pumping wastewater and thereby offering the opportunity to install facilities such as cabinet showers or toilets in the places where the waste water cannot be led directly to the main sewer by means of a natural downward slope. It is focused on reliability and quick installation as well as an easy and clean service. The sololift2 automatically starts and stops according to demand. Robustness and operational reliability: The powerful motor ensures optimum operational reliability, even when, for instance, feminine hygiene products are occasionally flushed down the toilet. Quick and easy installation or replacement: With adjustable discharge and inlet connections the Sololift2 is easy to install or replace existing installations. Sololift also offers a slim design for installation in confined spaces. Convenient maintenance: The removable, compact pump-motor unit makes any maintenance job a first and clean matter. No need to disconnect discharge and inlet pipes or to remove the unit for service. 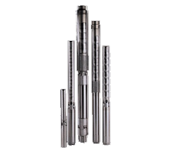 The Grundfos SP A is a 4-inch multi-stage, submersible pump designed for operation in boreholes. SP A is made entirely of corrosion-resistant stainless steel, thereby offering high operating reliability regardless of the application. The SP A offers high efficiency along with great resistance to sand and other abrasive particles. 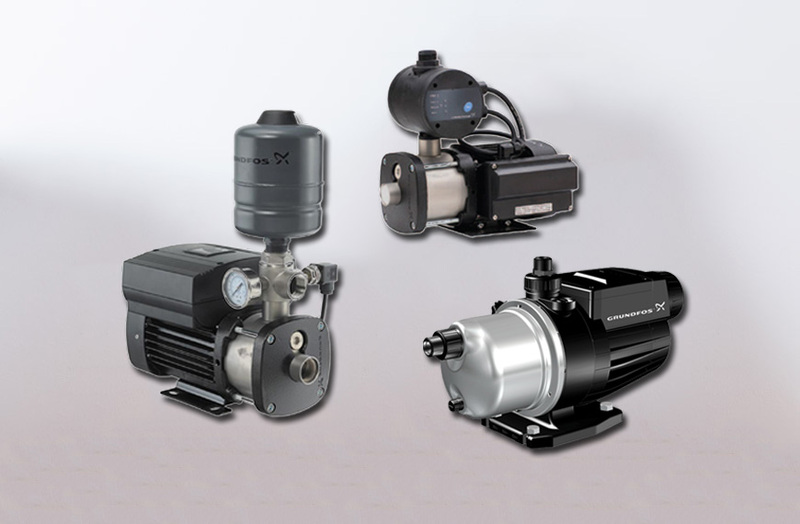 100% high-grade stainless steel inside and outside: As standard, all Grundfos SP A pumps are made entirely of stainless steel DNI 1,4301 (AISI 1304). 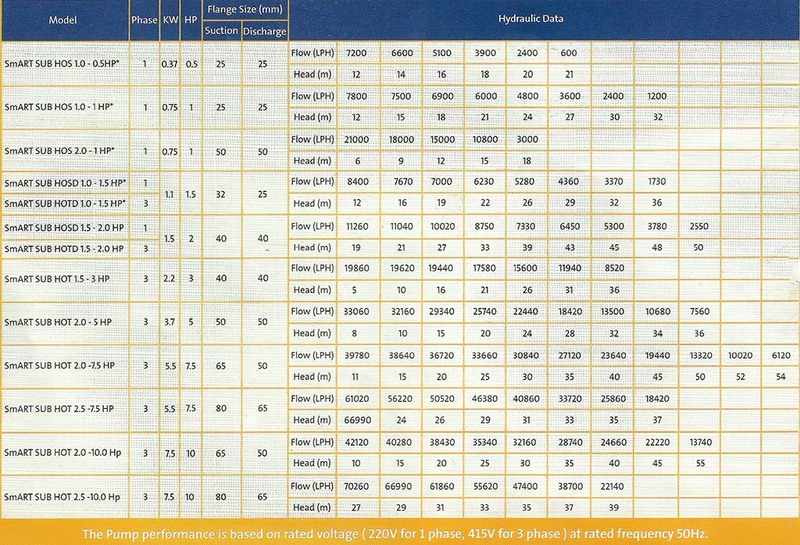 Where particularly aggressive liquids are encountered, the SP pumps are available in extra high grade stainless steel DIN 1.4401 (AISI 316) or, for severe conditions, DIN 1.4539 (AISI 904 L) providing maximum reliability. Bearings with sand channels: All Bearings are water lubricated and have a squared shape, enabling sand particles, if any, to leave the pump together with pump liquid. Inlet strainer: The pump is mounted with an inlet strainer preventing particles over a certain size from entering the pump. Non- return valve: SP A pumps have a built-in-non return valve preventing backflow in connection with pump stoppage. Motor burnout protection: Protecting the motor against high motor temperatures is the simplest and cheapest way of avoiding a reduced motor life. The SP A motor is available with built-in temperature sensor for monitoring and protection against overheating. Optional monitoring and controlling:A complete monitoring and control system is available for constant optimization of the pumping system. Higher flow past motor equals higher permissible liquid temperature. The Grundfos Jp basic is a self-priming, single-stage jet jump. It is deal for a wide variety of domestic water transfer and supply jobs, especially where self-priming operation is necessary. It has built-in ejector with guide vanes for optimum self-priming properties. The body of the JP basic is made of cast iron treated against corrosion. Installation of the JP basic is simply plug-and-pump, as the pump requires no motor protection. With a suction-lift upto 8m, this pump is ideal for transferring water from a well or ground tanks. 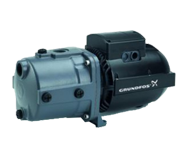 This feature makes this pump ideal for a large variety of installations. Clean, thin, non-aggressive, non-explosive, clear cold, fresh water without abrasives, solid particles or fibers.